Maybe you’ve seen Comet Q2 Lovejoy. It’s a big fuzzy ball in binoculars low in the southern sky in the little constellation Lepus the Hare. That’s the comet’s coma or temporary atmosphere of dust and gas that forms when ice vaporizes in sunlight from the nucleus. Until recently a faint 3° ion or gas tail trailed in the coma’s wake, but on and around December 23rd it snapped off and was ferried away by the solar wind. Just as quickly, Lovejoy re-grew a new ion tail but can’t seem to hold onto that one either. Like a feather in the wind, it’s in the process of being whisked away today. Magnetic field lines bound up in the sun’s wind pile up and drape around a comet’s nucleus to shape the blue ion tail. Notice the oppositely-directed fields on the comet’s backside. The top set points away from the comet; the bottom set toward. In strong wind gusts, the two can be squeezed together and reconnect, releasing energy that snaps off a comet’s tail. Credit: Tufts University. Easy come, easy go. Comets usually have two tails, one of dust particles that reflect sunlight and another of ionized gases that fluoresce in Sun’s ultraviolet radiation. Ion tails form when cometary gases, primarily carbon monoxide, are ionized by solar radiation and lose an electron to become positively charged. Once “electrified”, they’re susceptible to magnetic fields embedded in the high-speed stream of charged particles flowing from the Sun called the solar wind. Magnetic field lines embedded in the wind drape around the comet and draw the ions into a long, skinny tail directly opposite the Sun. Disconnection events happen when fluctuations in the solar wind cause oppositely directed magnetic fields to reconnect in explosive fashion and release energy that severs the tail. Set free, it drifts away from the comet and dissipates. In active comets, the nucleus continues to produce gases, which in turn are ionized by the Sun and drawn out into a replacement appendage. In one of those delightful coincidences, comets and geckos both share the ability to re-grow a lost tail. Comet Halley experienced two ion tail disconnection events in 1986, but one of the most dramatic was recorded by NASA’s STEREO spacecraft on April 20, 2007. A powerful coronal mass ejection (CME) blew by comet 2P/Encke that spring day wreaking havoc with its tail. Magnetic field lines from the plasma blast reconnected with opposite polarity magnetic fields draped around the comet much like when the north and south poles of two magnets snap together. The result? A burst of energy that sent the tail flying. Comet Lovejoy may have also crossed a sector boundary where the magnetic field carried across the Solar System by Sun’s constant breeze changed direction from south to north or north to south, opposite the magnetic domain the comet was immersed in before the crossing. Whether solar wind flutters, coronal mass ejections or sector boundary crossings, more tail budding likely lies in Lovejoy’s future. Like the chard in your garden that continues to sprout after repeated snipping, the comet seems poised to spring new tails on demand. If you haven’t seen the comet, it’s now glowing at magnitude +5.5 and faintly visible to the naked eye from a dark sky site. Without an obvious dust tail and sporting a faint ion tail(s), the comet’s basically a giant coma, a fuzzy glowing ball easily visible in a pair of binoculars or small telescope. In a very real sense, Comet Lovejoy experienced a space weather event much like what happens when a CME compresses Earth’s magnetic field causing field lines of opposite polarity to reconnect on the back or nightside of the planet. The energy released sends millions of electrons and protons cascading down into our upper atmosphere where they stimulate molecules of oxygen and nitrogen to glow and produce the aurora. One wonders whether comets might even experience their own brief auroral displays. Excellent visualization showing how magnetic fields line on Earth’s nightside reconnect to create the rain of electrons that cause the aurora borealis. Notice the similarity to comet tail loss. Thanks Bob! YES! I want to bag’ this comet, but haven’t had clear enough skies to do that… dzzzz. Maybe tonight? La Selena (The Moon) is beginning to loom large and right in the wrong place, but might not be a show stopper with this bright of a comet anyway? I’ve been getting some ‘grief’ from some quarters when I’ve made any statement(s) that a passing CME by a comet might brighten it substantially? What’s your take on that? Could a CME passage cause a sudden brightening of a comet? Shock waves anyone? Good luck – I hope it’s clear for you. I saw the comet in moonlight last night and it was impressive in binoculars. Very easy to see in 10x50s and 8x40s. No tail but a large ~15′ coma. As far as CMEs go, it’s clear that the one that snapped off Encke’s tail temporarily caused it to brighten. 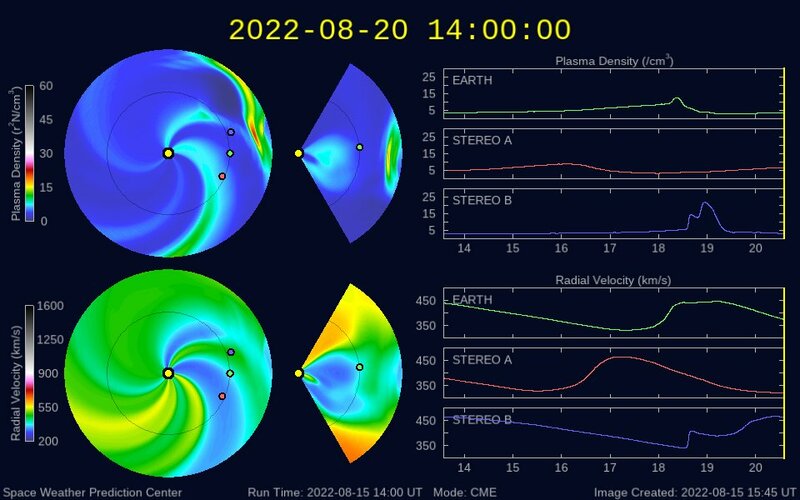 Otherwise I’ve not seen or heard evidence of a regular CME-comet brightness outburst connection. Too bad the STEREO mission has had an interruption in one of the satellite nodes because THAT mission might provide confirmation – if it exists? I like the overhead view images generated by STEREO and other data of CME wavefront(s) expanding outward from Sol, kind of ‘water sprinkler’ style. Thank you very much for the excellent information on Comet Q2 Lovejoy. How large is the coma on this comet? We are still waiting for the right place and cloudless night to view the comet. Thanks! Just saw the comet last night and estimated the coma diameter at ~15 arc minutes. Very impressive in a telescope and easy in 10×50 binoculars. Currently, how large is Q2’s coma compared to a planet?